For one of her final public appearances, the late Diana, Princess of Wales attended a performance of Swan Lake at the Royal Albert Hall in London. Now, the necklace that she wore at that event is being sold at auction -- for the third time. 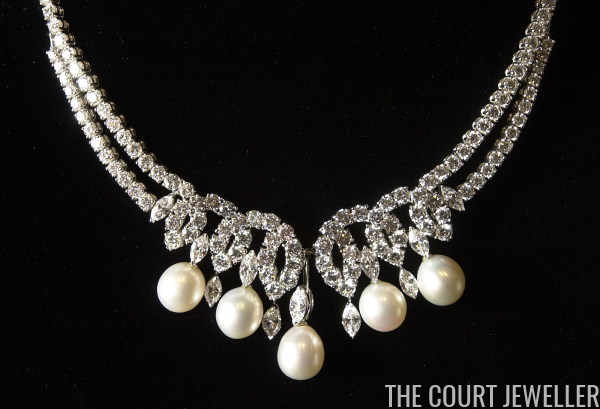 The diamond and South Sea pearl necklace was made by Garrard, the firm that was then serving as the crown jeweler. The necklace was actually designed with input from Diana herself. She wore the piece in public for the only time on June 3, 1997. Garrard also made a pair of coordinating diamond and pearl earrings, but they weren't finished yet when she died that August. 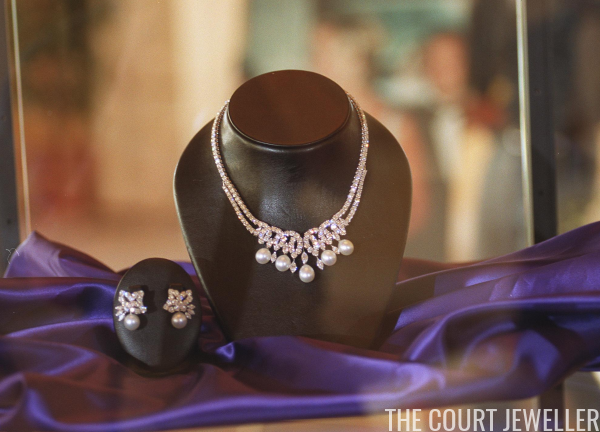 Nevertheless, the necklace and earrings are often referred to as the "Swan Lake Suite" because of Diana's famous appearance in the necklace. When Diana died, she had not yet purchased suite of jewels. (You'll sometimes see her described as the "original owner" of the necklace, but that's incorrect; she was its original wearer.) Six months after her death, Garrard sold the necklace and earrings to a private buyer. Newspaper reports identify him as a British lord who worked as a managing director for Lehman Brothers in London. He purchased the suite for his wife, who reportedly never wore the jewels, because she was too uncomfortable with their connection to the late princess who died so tragically. 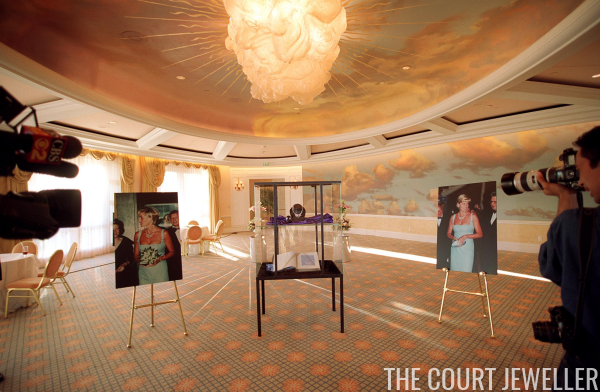 In 1999, the couple who owned the suite decided to sell. 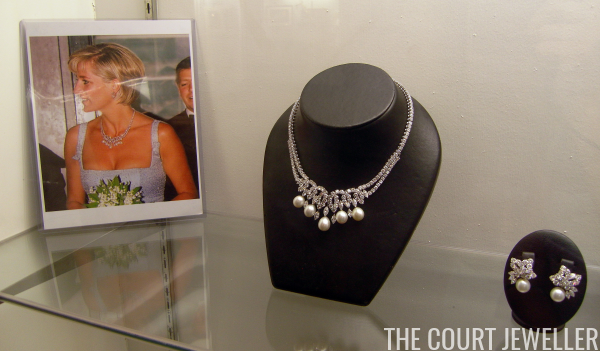 After a press tour that included an appearance on the Today show, the necklace and earrings were sold at Guernsey's auction house in New York on December 18, 1999. The set was purchased by a Texan businessman, Jim McIngvale, for just shy of a million dollars. A decade later, the set went on the block once more. Guernsey's was the firm entrusted to sell the pieces once more. 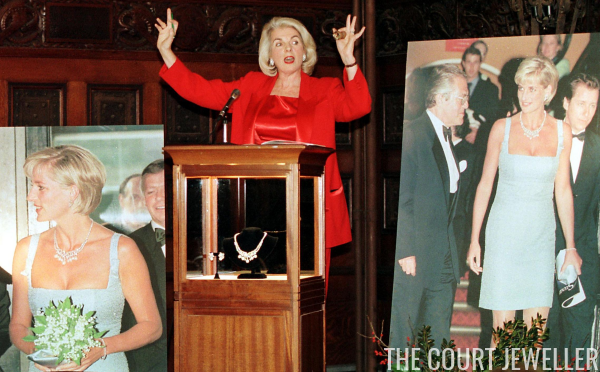 They advertised the set's royal connections heavily, even remarking that "it is the general belief that these may well be the only substantial jewels worn by Diana that will ever be sold." (A claim that I think is probably up for debate.) 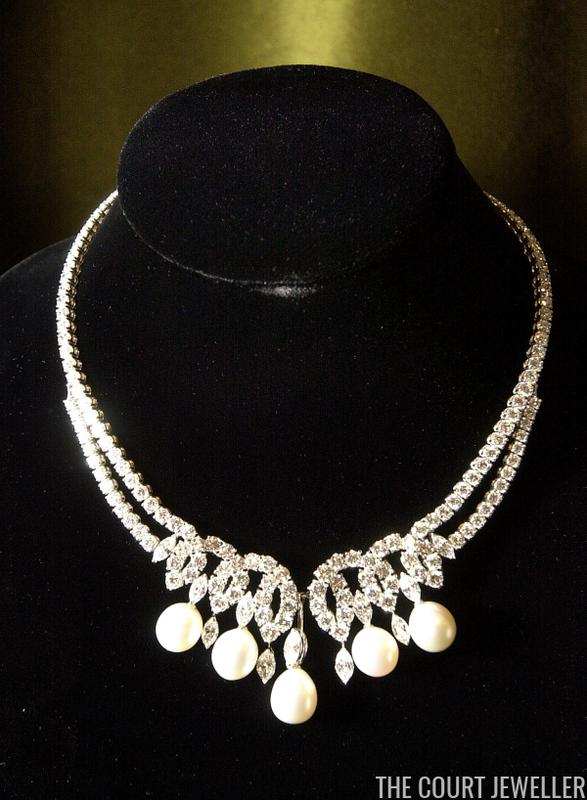 In the lot notes, the necklace was described as "brilliant cut diamond and marquise diamond scroll motif centre with a South Sea cultured pearl five stone and marquise diamond fringe drop, to a brilliant cut diamond two row collet backchain tapering to a single row; mounted in platinum, claw set, with an integral box clasp. It contains: 5 matching cultured pearls 12 mm. 11 marquise diamonds 7.71 carats. 3 marquise diamonds 0.88 carats. 164 diamonds 42.35 carats." 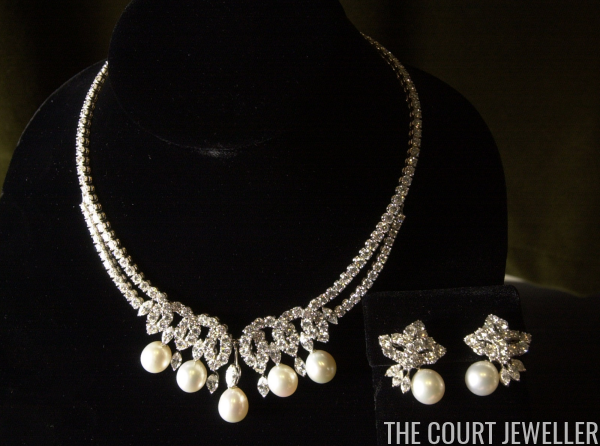 The auction notes describe the earrings as "pair of brilliant cut diamond and marquise diamond fancy cluster top, South Sea cultured pearl drop earrings; mounted in platinum, claw set, to peg and clip fittings. They contain: 2 matching cultured pearls 12 mm. 6 marquise diamonds." The set was auctioned for the second time in September 2010 in New York. The seller didn't recoup his investment; the necklace and earrings were bought by a Ukranian couple, who paid $632,000 for the set. This was well under the auction estimate, which was set at between $1.5 and $2.5 million.